VICTORIA – The annual meeting and symposium of the BC Sheep Federation (BCSF) in Central Saanich on September 29 began with a panel of long-time sheep producers from across the province discussing challenges facing the BC sheep industry. BCSF president Valerie Moilliet Gerber sums up her view of challenges for the BC sheep industry in two words: predators and politicians. Gerber has worked hard with other sheep producers to bring a wild predator compensation program to fruition but provincial elections and wildfires have delayed the program and her frustration is evident. “Every turn, something else happens to slow us down,” says Gerber. This summer there were losses all over the province to every type of predator. Gerber’s family lost 21 sheep to a wolf. Metchosin abattoir operator John Buchanan of Parry Bay Sheep Farm also lists predators as a challenge. The area where his sheep graze was long predator-free. While coyotes remain absent from Vancouver Island, bear and cougar attacks are up. Buchanan feels he’s at risk of being pushed off grazing areas. High feed costs on Vancouver Island mean access to grass is critical. Predators aren’t Buchanan’s only concern. As an abattoir operator, Buchanan faces challenges keeping his workers. A concern for local slaughter plants is seasonal fluctuations in demand for their services. Rather than lay off then rehire workers, Buchanan prefers to retain his workers and find year-round work for them. To do this, he depends on the support of local growers to keep the plant operating. And his view on the price of lamb? “Lamb will never be priced like chicken when it is so expensive to grow,” he says. Saturna Island sheep producer and abattoir operator Jacques Campbell serves as director to the BC Association of Abattoirs (BCAA). Her farm was developed by her parents who were agriculture graduates from UBC. The slaughterhouse was built in 1958 and used for years before the meat regulations changed in 2007. Every time a grant became available, Campbell applied. She took a humane handling course, then became eligible to access funds to improve animal welfare and built a cattle kill-box. She trained to score lambs for the BC Premium Lamb program developed by BCSF and BCAA with a focus on food safety and ensuring local lamb was humanely handled and slaughtered, and traceable. Campbell’s abattoir operates seasonally from June to January because feed is too expensive to lamb year-round and there is other work on the farm to do. Lorea Tomsin, president of the Inter Island Sheep Breeders Association and BC director with the Canadian Sheep Breeders’ Association, commented on the year-long split in the Canadian Sheep Federation. Ontario and Alberta have withdrawn from the organization leaving just seven provinces represented by the national organization. Tomsin emphasized the importance of a united national organization to speak for sheep producers on issues of national concern, including biosecurity, strong trade policies and the upcoming traceability regulations. It’s also important for the association to be able to serve as the industry’s ear to government. Tomsin also touched on the value of lamb meat. She encouraged producers to price with confidence, knowing what their costs are and the work that goes into raising the animals. “Don’t be shy to price lamb fairly – to you,” she says. 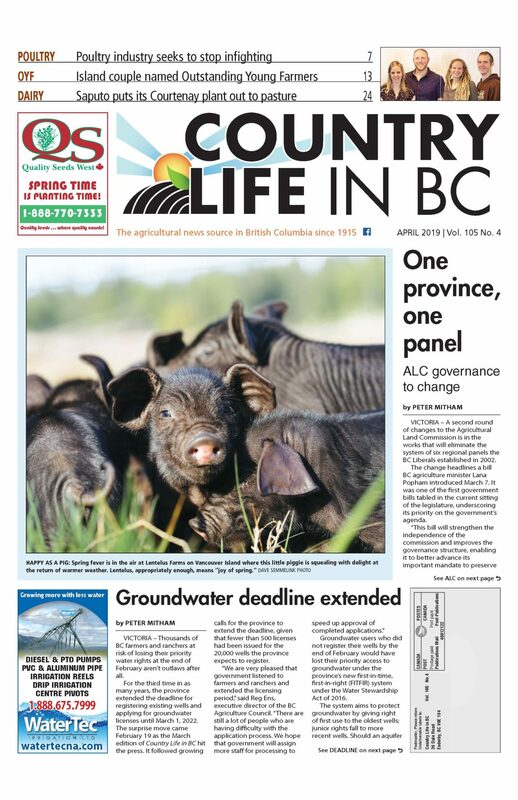 Bev Greenwell, president of the BC Purebred Sheep Breeders’ Association and editor of BC Sheep N’Ewes for the BC Sheep Federation, talked about the challenges on her ranch in Princeton. Greenwell and her husband grow alfalfa-grass hay, have cattle and raise purebred Suffolks that they sell as breeding stock or custom slaughtered lambs. Raising and slaughtering the animals is a challenge, though, because feed, equipment and the abattoir are two hours away. Moreover, slaughter dates must be booked before the lambs are born. Greenwell also mentions efforts to meet the challenge of aging farmers by using more mechanization for water and haying equipment. Greenwell has concerns about climate change, especially with recent droughts and wildfires. She was impacted this summer after a wet, warm spring encouraged a bolt of grass growth, then heat withered it into the perfect fuel for fires. Combined with bighorn sheep, which often show up where they shouldn’t be, and sheep ranching in Princeton is clearly no picnic. “Politics are intensified,” says Greenwell.